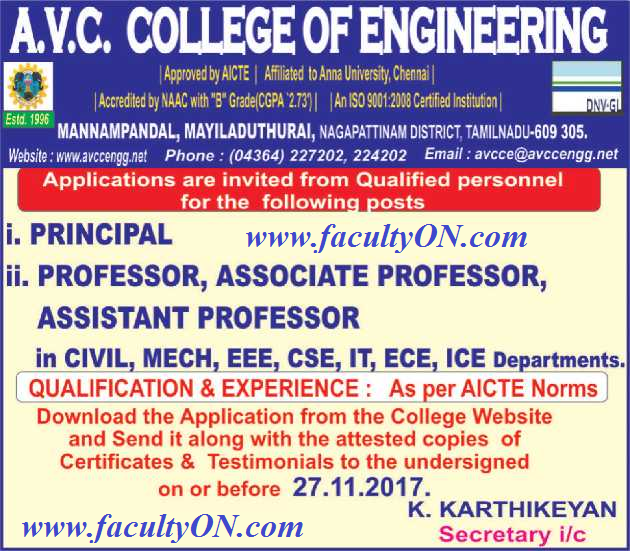 A.V.C College of Engineering, Nagapattinam has advertised in THE HINDU newspaper for the recruitment of Professor / Associate Professor / Assistant Professor / Principal jobs vacancies. Interested and eligible job aspirants are requested to apply on or before 27th November 2017. Check out further more details below. About College: A. V. C. College of Engineering is a self-financing college for engineering education located in the town of Mayiladuthurai, in the coastial district of Nagapattinam within the Indian state of Tamil Nadu. A. V. C. College of Engineering was started in 1996 by A. V. Charities, which began its educational services by starting the A. V. C. College in 1955 and the A. V. C. Polytechnic in 1983. The College of Engineering has been approved by All India Council for Technical Education (AICTE) and is an ISO 9001:2008 certified instituition. Qualifications: As per AICTE norms. Salary: As per AICTE norms. How to Apply: Interested and eligible candidates are requested to send applications in prescribed format downloaded from college website along with attested copies of supporting documents of certificates and experience to the following postal address. Reference: Advertisement on THE HINDU newspaper dated 15th November 2017.